As office machines, typewriters are passÃ©. As fighting game controllers, typewriters are surprisingly attractive. An SRK forum member using the SNK-esque nom de Internet "NeoBlood" recently shared a pictorial walkthrough of his latest modding project with the site. 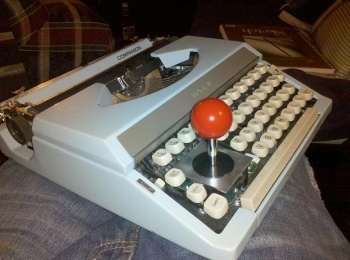 His goal: Turn a $5 antique store typewriter into a modern fighting stick. Surprisingly, the mod seems relatively simple, assuming you know your way around a dremel tool and are comfortable ripping apart Cold War-era productivity machines. NeoBlood's summary even says as much. "All in all I'm surprised this project actually came out as well as it did, considering there was no real planning to it," he writes. "I just found stuff I thought would work, and it did." I'm particularly taken with this mod simply because it avoids the cliche so many DIY projects fall into. It's simple, functional, and utilizes technology that is, at once, archaic yet recent enough to be instantly familiar. Unfortunately, it seems that NeoBlood is eyeing a future steeped in exactly the sort of cliches I just vaguely railed against. "My next idea might be to make a steam-punk arcade stick using old telegraph parts," he adds. Still, I'm willing to praise his work up until the moment he starts adding unnecessary brass flourishes and manufactured patina to things. If for no other reason than I love how clicky this stick is. A round of Marvel Vs. Capcom 3 on this thing would sound like a treble-heavy recreation of the Normandy landing. Clicky, clickity clack, Hadouken! Clickity, clack clackity, Drill Claw! I would never get tired of that.